Unquestionably the most iconic Japanese fighter of World War II, the Mitsubishi A6M Rei-Sen, Type Zero fighter was used from the initial raid on Pearl Harbor up to the Kamikaze attacks at the end of the war. Facing off against the likes of the Wildcat, Corsair and even the Spitfire, the Zero gained a legendary reputation amongst Allied pilots due to its incredible manoeuvrability. Detailed analysis of its technical qualities show why the Zero was so feared, but also pinpoints the weaknesses that would eventually be its downfall as Allied pilots learned how to combat it. 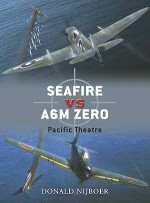 A selection of historical photographs and unique artwork accompany the analysis as James D'Angina delves into the history of the premier Axis fighter of the Pacific Theatre, exploring the design and combat effectiveness of the Zero as well as the tactics developed by Allied pilots to counter it. James D'Angina is the former Curator for the US Army's Air Defense Artillery Museum, Fort Bliss, and has written multiple articles for the US Air Force and the United States Marine Corps. Adam Tooby is an internationally renowned digital aviation artist and illustrator. His work can be found in publications worldwide and as box art for model aircraft kits. He also runs a successful illustration studio and aviation prints business.